This week tees off with Audra McDonald singing classics from Broadway and the American Songbook, and dancers from American Ballet Theatre pirouetting to Bernstein’s Fancy Free. By the weekend, it’s all about Steven Spielberg’s heartwarming masterpiece, E.T. with the Los Angeles Philharmonic performing John Williams’ entire Academy Award®-winning score while the movie is shown in HD on the Bowl’s big screen. 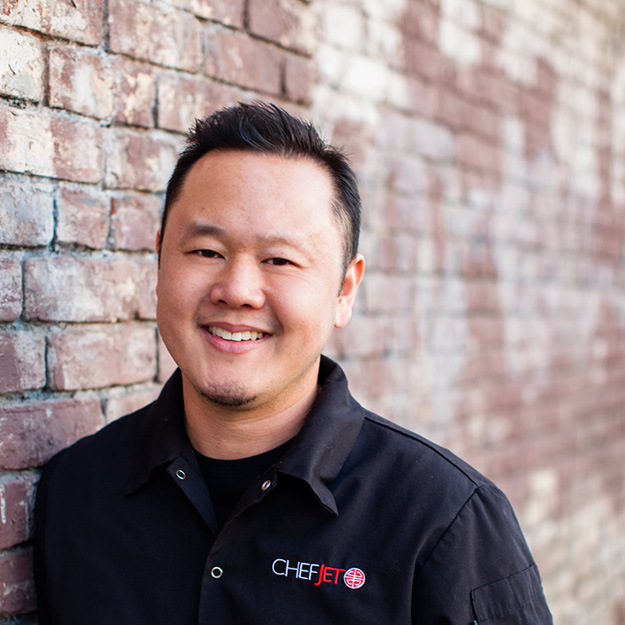 Attending this world-exclusive event is a done deal for Jet Tila, chef-partner of Stir Market, a food hall on Beverly Boulevard. Slice cauliflower into 1 inch thick slices, leaving the core intact. Cooking in batches, roast each piece of cauliflower separately in a heavy bottom pan with olive oil. Cook until tender enough to pierce with a knife, but leaving a little firm. Season with garlic, jalapeno, shallot, zest, salt and pepper and finish cooking for 1 minute on low flame, taking care not to burn the garlic. Arrange on large platter and garnish with dill sprigs, parsley, and celery leaves. Add warm water (½ the amount) in a container. Add the sugar and salt to warm water, stir until completely dissolved. Add herbs and aromatics to warm mixture. Add the other half of iced water to mixture. Now place bellies and tenderloins in a container with the brine mixture and refrigerate for 48 hours. Combine porchetta herb rub dry ingredients with olive oil. Apply rub to inside of pork belly. Place belly skin side down and place tenderloin on top of belly. Roll belly around loin so the ends meet. Tie with twine around belly/loin spaced one inch apart. Score belly skin with a knife. Move to a wire rack and let sit at room temperature for one hour. Preheat convection oven to 400 degrees. Cook for 1 hour to brown and crisp up the skin. Lower to 350° F for approximately 45-60 minutes depending on size of the porchetta; the internal temperature should be 145 degrees. Slice porchetta crosswise and serve. Grill the whole grain slice of bread to golden brown. Spread ricotta over the bread. Cut bread into 3 triangular pieces. Slice strawberries in half and then slice into thin pieces, fan out over the ricotta. Finish with a drizzle of lavender honey and sprinkle of fresh mint. The incomparable Audra McDonald sings classics from Broadway and the American Songbook. Gifted dancers from American Ballet Theatre bring to life Bernstein’s Fancy Free, using Jerome Robbins’ zestful 1944 choreography. The internationally beloved Portland band blends rhythms from samba and swing to cool standards with style. Engaging pianist/bandleader Thomas Lauderdale guides Pink Martini’s eclectic sounds alongside the ravishing vocals of China Forbes and Storm Large. Revered as the former leader of the Tonight Show orchestra, the 87-year-old Severinsen opens the evening with his big band. E.T. The Extra Terrestrial – in concert! Bring your entire family to this extraordinary, world-premiere event, as the Los Angeles Philharmonic performs John Williams’ entire Academy Award®-winning score from Steven Spielberg’s heartwarming masterpiece about a boy and his alien friend, live-to-picture while this beloved film is shown in HD on the Bowl’s big screen. Don’t miss E.T. under the stars, as you’ve never seen or heard it before!